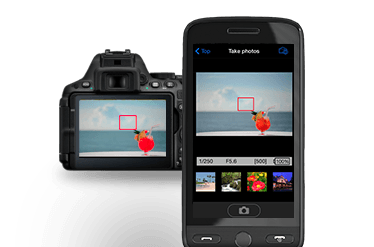 The Wireless Mobile Utility app connects Nikon's first generations of Wi-Fi® enabled cameras—whether built-in or using the WU-1a or WU-1b Wireless Mobile Adapter—to compatible iPhone®, iPad® and/or iPod touch® and Android™ powered devices. 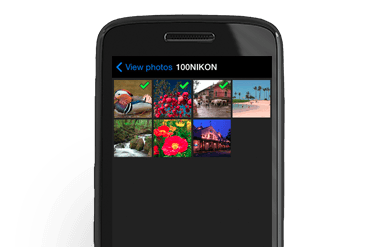 The app makes it easy to download photos from your camera, control your camera remotely and share your photos hassle-free through email, texting or uploading to social sites. The Wireless Mobile Utility wirelessly connects your compatible iPhone®, iPad® and/or iPod touch® or Android™ powered device to compatible Nikon digital cameras, letting you download photos, take pictures remotely, and share them hassle-free via e-mail or upload to social networking sites. The Wireless Mobile Utility app is used with select Nikon digital cameras that feature built-in Wi-Fi connectivity as well as specific models that are compatible with the WU-1a or WU-1b Wireless Mobile Adapters. Take a great photo with your Nikon camera and send it to your compatible smartphone or tablet without missing a beat. Once it’s on your smart device or tablet, share it like usual—by text message, email or posting to your favorite site. The noted cameras Wi-Fi® capability (whether built-in or using the WU-1a/WU-1b Wireless Mobile Adapter) can only be used with a compatible iPhone®, iPad®, and/or iPod touch® or smart devices running on the Android™ operating system. Nikons Wireless Mobility Utility application must be installed on the device before it can be used with this camera. Note: The Bluetooth® word mark and logos are registered trademarks owned by Bluetooth SIG, Inc. and	any use of such marks by Nikon Corporation is under license.